Vancouver, BC – January 23, 2018 – Comstock Metals Ltd. (TSX-V: CSL) (“Comstock” or the “Company”) is pleased to report on metallurgical test work recently completed on sample materials from the Preview SW deposit. Test work has been completed at ALS Metallurgy of Kamloops B.C., in December 2017 under the direction of Jeffrey B. Austin, P.Eng and is a follow-up to previous testing completed in 20131. Test work in 2017 was focused on better defining the quality of gravity and flotation concentrates that are expected from the Preview project materials and providing preliminary test results for cyanide leaching of flotation concentrate. Cyanide leaching of flotation concentrates indicated that in excess of 98 percent of the gold contained in flotation concentrates could be extracted using industry standard cyanide leaching conditions. This test work better defines the potential processing options for the Preview project and indicates that gold recovery using gravity, flotation and concentrate leaching is possible. As well, flotation concentrates are shown to have sufficient quality to warrant evaluating the off-site processing alternatives of these concentrates in order to potentially simplify on-site processing. Optimization work is still required for the metallurgical process at Preview, but no significant metallurgical issues related to gold recovery have been identified from the work to date. The Company is planning to conduct initial metallurgical testing on samples from the North Zone, located 2.5 km northeast of the Preview SW deposit where multiple high-grade gold zones were intersected in 2017 drilling (see September 28, 2017 news release). Two composite samples of drill core from representative domains within the Preview SW deposit were assembled for testing and sample characterization (see Table 1). Approximately 179 kilograms of sample material was made available for test work. 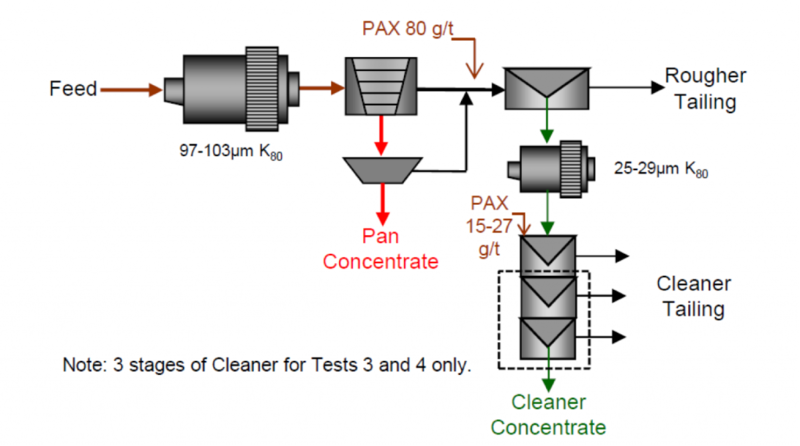 The large sample size was needed to generate meaningful concentrate samples for testing purposes. Gravity concentration and bulk flotation test results for the Zone 103 and Zone 104 composites is presented below in Table 2 and 3, respectively. A general flowsheet outlining the metallurgical testing stages for the Preview SW deposit is shown in the diagram below. Jeffrey B. Austin, P.Eng., Qualified Person as defined by National Instrument 43-101, supervised the metallurgical test work completed at ALS Metallurgy, and prepared this news release. David A. Terry, Ph.D., P.Geo., a Qualified Person as defined by National Instrument 43-101, and an Officer and Director of Comstock, has reviewed and approved the scientific and technical disclosure in this news release.